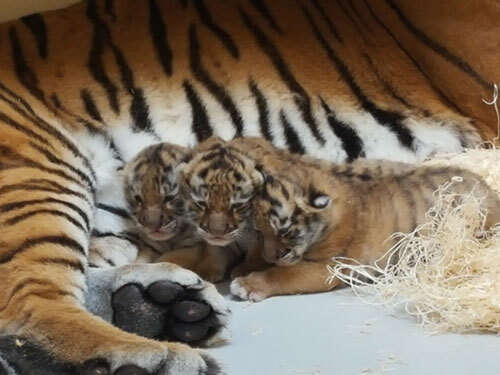 The Milwaukee County Zoo is excited to announce that three Amur (Siberian) tigers were recently born at the Zoo. 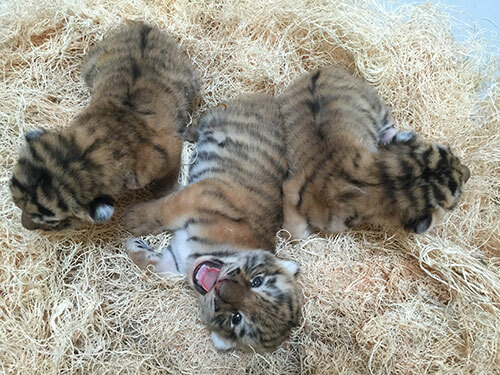 The cubs were born Sept. 14 to mother, Amba, and dad, Strannik, both 13 years old. This is the second litter for Amba, who is considered an older mother, and the fourth litter for Strannik. As of Oct. 2, the weights for the cubs were 5.6 pounds, 5.9 pounds and 6.9 pounds. The cubs are weighed every two to three days to monitor weight. 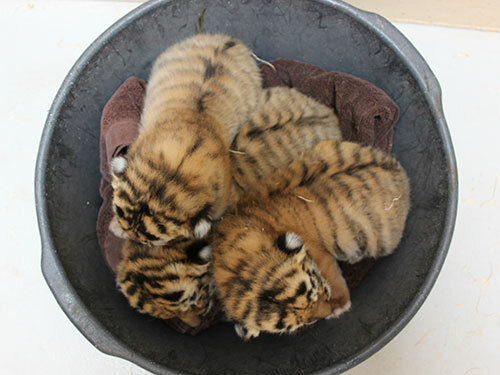 Zookeepers report all three cubs are healthy and growing quickly. 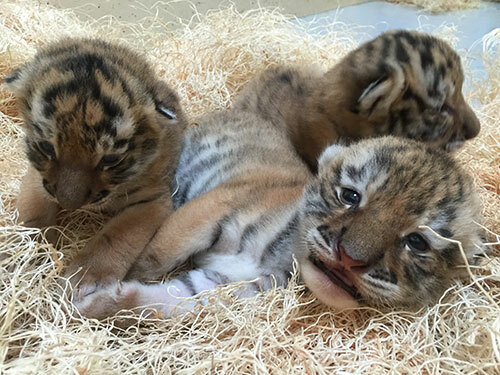 The last litter of tiger cubs born at the Zoo was in 2009; female Tula from this litter remains at the Zoo, and has become a visitor favorite. The cubs have a nest of wood wool (curved, soft wood shavings) in an off-exhibit den, and are nursing from mom approximately 6–8 times per day. Their immune systems are developing and they’re learning to get their legs under them, in order to begin walking. They are expected to start walking at about 3 weeks old, and their eyes are now open but not yet focusing. Cubs are regularly monitored through both “in-person” viewing as well as a video monitor. A trusting relationship between the keepers and Amba has been formed over the years through positive reinforcement training. On a regular basis, zookeepers offer training for all of the residents of the Big Cat building; whether it be for the medical, emotional or physical needs of the animals. This training also allowed keepers and veterinary staff to ultrasound Amba to confirm her pregnancy in the weeks prior to her giving birth. Because Amba and the cubs won’t be on public exhibit for several weeks, the Zoo invites fans to view its Facebook page for updates, photos and videos of the new family. A public announcement and media invite will follow when the cubs are ready to make their public debut! Tigers are endangered in the wild; populations in Asia now number as few as 3,200. Major threats are habitat loss, poaching, prey depletion and illegal trafficking. Amur tigers are particularly threatened; numbers show less than 500 of this subspecies in the wild. For more information on current conservation projects addressing these threats, visit the Tiger Conservation Campaign’s website. The Milwaukee County Zoo is a proud participant of the Prusten Project, an innovative project which monitors tiger vocalizations resulting in a more efficient and less disruptive census of critical populations of wild tigers. A first-of-its-kind undertaking, the Prusten Project is monitoring areas of populations where dense jungle prohibits visual confirmation, thus making way for saving these core area habitats. For more information on the Prusten Project, please visit theprustenproject.org. Click on the thumbnails below to browse through photos.